A self portrait is a strangely narcissistic affair, spending all that time looking at your own head, but the benefits are undeniable: the model is always available, and you’re drawing from life, not a flat image with all the problems already worked out. I took the often-heard advice to start with large brushes — a size larger than seems necessary — and then keep using these large sizes as long as possible. Also, I was mindful of not being too worried about destroying part of the painting that had gone well if that’s what was needed to repair or progress another part. This was a revelation to me, that oil paint can be reworked and corrected as long as you have the will or the patience. As Terry Miura said: if you found it once, you can find it again. I kept this as a mantra during the times when it all dissolved to mush. That said, I’ve left it in a state of half finished roughness, knowing that if I built up one area I’d have to revisit the others. And the near-monochrome brown is a bit much. When to stop? I also need to work out a way to light the canvas as I’m painting. 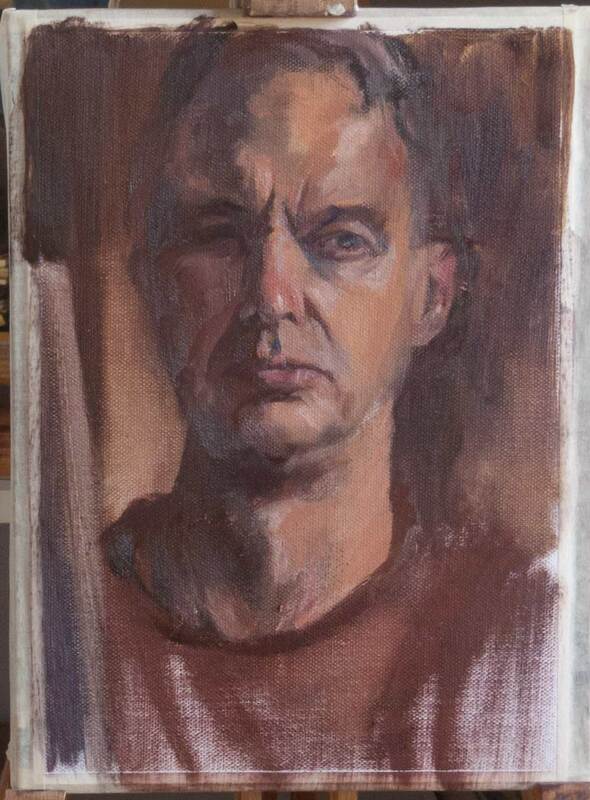 Working with no medium, the raking light on the brush strokes throws off the values, especially on the left side of the face. Thanks, Ed. The brush is down, I’m walking away….. probably outside to do some sketching. Hello James (for that is how i think of you after all these years). Your Mum gave me this link last year when we met after a long time, and i look from time to time. I love your work and your thoughts on producing it. Your self portrait is fine – and has aspects of your Dad. I wonder how familiar you are with Urban Sketchers? They met last week in Manchester, coinciding with a really interesting exhibition called Unfolding Stories. I thought you might be interested. Keep up the good work. All the best. Barbara M.
Great to hear from you, and thanks for the comments. Yes, I’ve heard of Urban Sketchers, in fact my friend Ed (who helped start me off on this whole sketching thing) has just come back from the Manchester meet where he was giving a talk. See more over at his blog, Mostly drawing. I hear you also paint. Are you on the web anywhere? Hi. Yes, I do paint and draw a bit, but in a very very modest sort of way. No web presence! And not the same discipline which I think you have. I think I am a dabbler! However, I get terrific pleasure from it. I started abround 2000, just using water colours. Since I moved to Manchester I have been using acrylics as well as water colour, and I find I can ger closer to what I want to achieve with the acrylics, often using a water colour done on site as a sketch for an acrylic to be worked up later. I am most at home with landscape, partly because I fail to progress in drawing…keep up the good work! I will check Ed’s blog. I’ve been reading a blog written by Stapleton Kearnes, a landscape painter based in New England. Reading from his earliest posts forward has been very informative. Landscape painting is something I’d like to do more, but the practicalities of setting up studio in the middle of a field is something I haven’t tackled yet. I think your idea of doing sketches on location as a base for work at home is a good idea and something I need to try myself. The Will Kemp Art School (see the Resources link at the top of this page) has some great videos and articles about painting in acrylics. Gouache is a lot of fun too, with similar handling to watercolour but with the opacity and covering power of acrylics if it’s put on thick enough. So much to try! Good to hear from you.